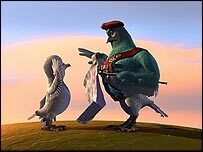 The story of a hapless carrier pigeon turned World War II hero is the theme of a new animated film due to hit cinema screens next year. 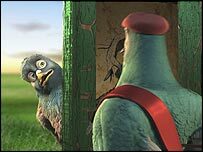 Featuring the voices of Ewan McGregor and Ricky Gervais, the film follows the adventures of Valiant - a carrier pigeon who is enlisted during World War II. He overcomes his small size to be entrusted with the greatest mission of the war by the Royal Air Force Homing Pigeon Service. It has taken a 170-strong army of animators and artists two years to complete the film which is co-produced by John H Williams - the man behind the highly successful Shrek films. His co-producer Curtis Augspurger said the film was looking "fantastic" and added he believed it would go down as well in the US as it would in Europe. It is based on the true story of the pigeon service used by the British to communicate with the French Resistance. A number of the pigeons were given medals during the conflict for their bravery, with the Germans breeding falcons to catch the pigeons. Augspurger said: "It is a coming-of-age film. It's the too young, too small hero that does battle with Goliath in the shape of German uber-falcon Van Talon." "They team up with the French Resistance mice who help them out and Valiant eventually becomes a hero." The film, which also features the voices of John Cleese, John Hurt and Hugh Laurie, is due to be released in the UK on 25 March. Augspurger said McGregor, who voices the lead role of Valiant, brought something special to the role. "Ewan was fantastic. He got along with director Gary Chapman incredibly well and they put together a really nice voice take. "He brought a personality and an innocence that brought the character together wonderfully. "Ricky Gervais also did a great job - he is so funny. He took his character Bugbuster to a level we didn't expect." Vanguard Productions opened a full-scale, computer-animation studio at Ealing Studios, in west London, to make the £20.7m ($40m) film. Augspurger said the film was the most ambitious animated movie being tackled outside the US. "When you think that the big animated films, like The Incredibles, work with budgets in excess of $100m it is a challenge. "But we have used what the giants have done to guide us and help us take shortcuts to achieve this."